SiteMile Project Bidding WordPress Theme – A Detailed Review. And How to Use it to Setup a Freelance Marketplace? Have you ever dreamt of creating a marketplace for freelancers? Maybe a site like Fiver or Upwork where you can give a robust platform to all freelancers to start their career. 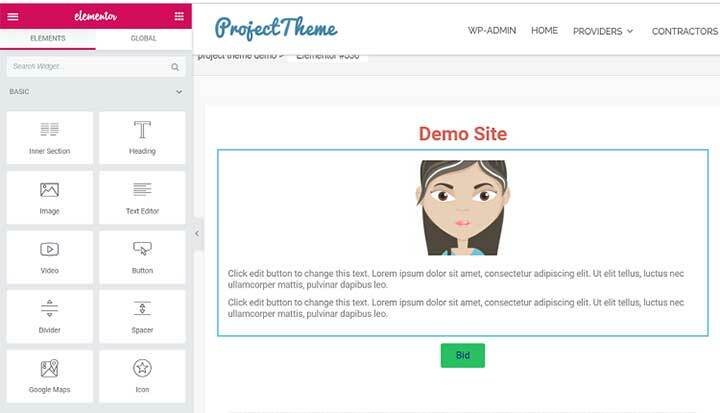 The Project WordPress Theme from Sitemile lets you create a website that you have always wanted. It enables you to create a marketplace for freelancer which can be a brilliant place to connect them with their employers. How can Project Bidding Theme help you? Firstly, it can help you build your website in a matter of minutes. Secondly, it will save you a lot of money that you would otherwise spend by hiring a developer. Thirdly, it will help you build a business that can generate income from the very first day. Project WordPress Theme is one of the easiest solutions to create a website. So no matter how new you are to this field, you can do it all by yourself without any external help. The Project WordPress Theme is groundwork if you are planning to build a website to bring in the freelancers of the world in one platform. This theme lets you give out chores or tasks on a daily basis, start a freelance marketplace, conduct project bidding and much more. The employers get the best work in an excellent deal, and the freelancers get handsomely rewarded. Each can use the website and access it from the front-end to either find a job or post one. Now for such a website to run smoothly among the two categories of users, Project WordPress Theme comes with a host of features, plugins and monetisation options to make it an interesting and fruitful place to ensure business efficiency and monetary benefits. You will be taken through its features elaborately in the next few paragraphs, and I hope this proves helpful for the newcomers in the online business platform. The Project Bidding WordPress Theme comes with a lot of features to get you started almost instantly. So let’s dive in and have a closer look at what this theme has to offer. This theme is compatible with all the visual media devices that are used at this age. So if you are building a website based on this theme, do not worry, it is fully functional in smartphones, laptops, desktops, and tabs. You can manage your listings, check out the latest jobs or tasks that are available, update your profile and coordinate with your freelancer and employer anywhere, any time and on any device. Each freelancer gets their very own user profile with certain basic information such as name, contact details, address, bank and wallet details, etc. But the best thing is the freelancers can make their profile unique by adding their skills, achievement, pictures, an overview of their professional life. Based on your work history, freelancers will be given feedback which can be displayed on the profile page along with their activity stats. 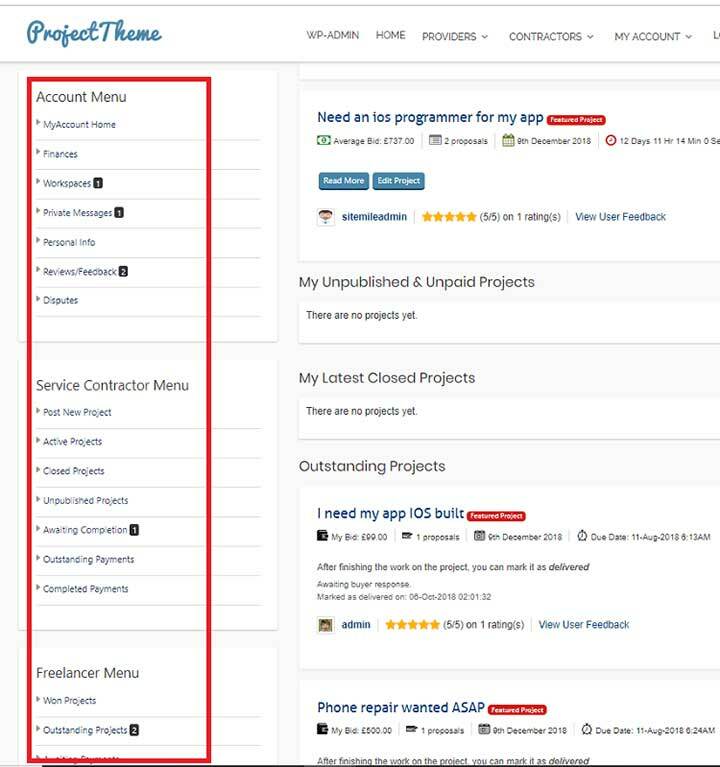 This feature when used to its fullest, is a clean way to grab more jobs or win more projects. Well, the basic version comes integrated with only PayPal but if you are willing to pay extra, then the doors open for you wide. The Email notification feature has been looked into with impeccable precision. From the point of registration, to bid for a job, accepting a job, completing a job and receiving the payment. The freelancer will be duly notified of every step of the business with their employer. Now, does it not make your professional life much easier to handle? Yes, it does. 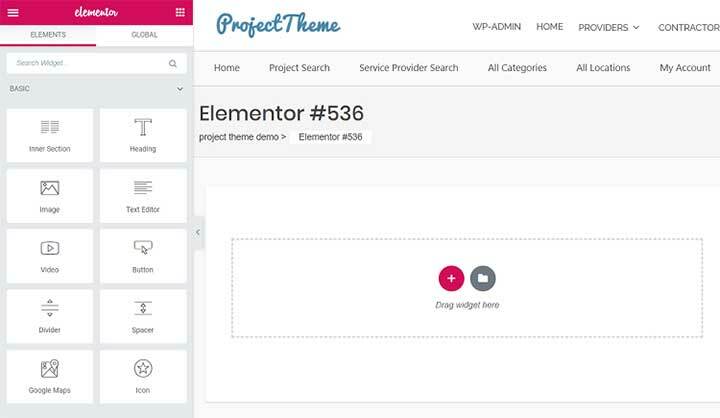 That’s the magic that’s the Project WordPress Theme brings to your career. Moreover, if you are freelancer that caters to the only certain type of jobs, you can easily register for them and when a job comes, Ping! You get an email right away. Charging a basic listing fee for the jobs that are listed. Fee for listing services in the featured category. Membership fee from the employers and the freelancers as well. Fixed fee for a certain task or job categories. Percentage fee for certain task categories. Well, the options are really endless and very promising. Now, what is a business if is confined within walls? The Project WordPress Theme comes with multi-language support. Usability of this feature is straightforward, but the possibilities of enhancing your user base are equally unimaginable. Since the Project WordPress Theme uses the GNU get text WordPress localization framework, by using a tool called POEDIT, you can translate the predefined English file to any language where you want to take your business. This is another neat feature that the Project WordPress Theme has to offer. Via the private messaging feature, the freelancers and employers can communicate in your platform without involving a third medium just for communication and also ensuring that no personal details are leaked. Being the administrator gives you total control of the texts to moderate them and keep a close eye on the activities in your website. As I mentioned, the theme at its basic version comes integrated with PayPal, which is also the most used and preferred payment gateway in many countries. The integration also supports the Adaptive and Delayed Chained payments under PayPal. You will not have to create a new Paypal account; you can log in with your already active account and start earning your rewards. Apart from being just a business listing and bidding website, the Project WordPress Theme also allows movement of digital, downloadable files such as PDFs, JPEGs, etc. Now, this is cool. Such a feature is extremely useful in the IT industry or if you need multiple freelancers to get the work done at a faster rate. The Theme supports major file formats, zip, rar, vector, etc. Now, this is an advantageous feature when it comes to being efficient at your job. Instead of making and accepting payments multiple payments for every job, you can use the credit system and conduct your transaction via virtual money and conduct a final transaction after the job is completed. 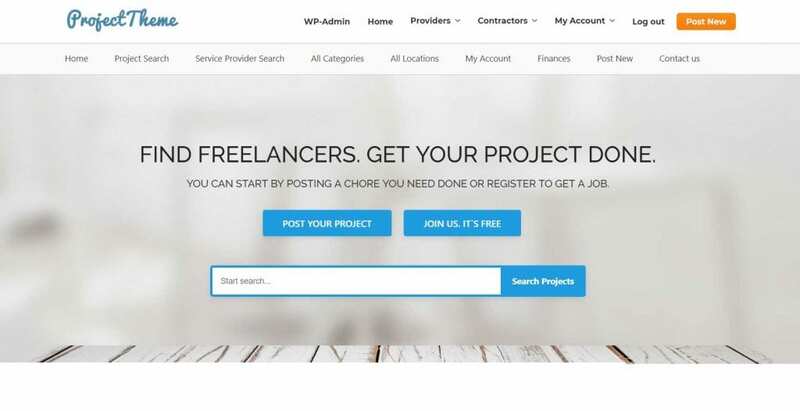 This feature is handy when all you want to do is good work, and you need the best freelancers in the market. 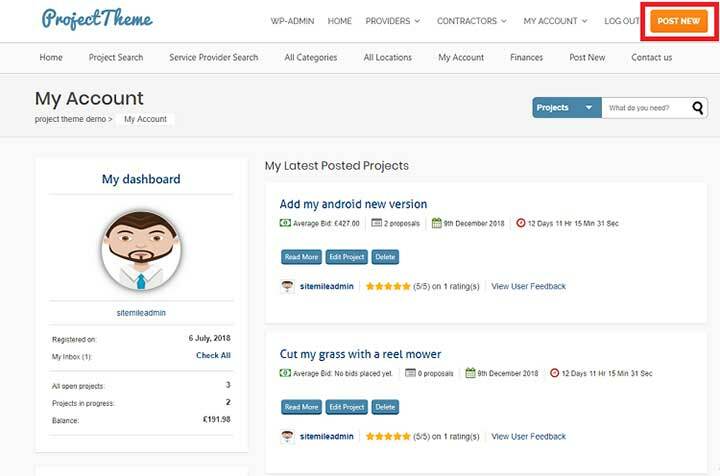 The feedback and rating system allows both the freelancers and employers to rate each other from 1 to 5-star icons. These ratings are visible to everyone and are displayed along with the user profile at the bidding tables. 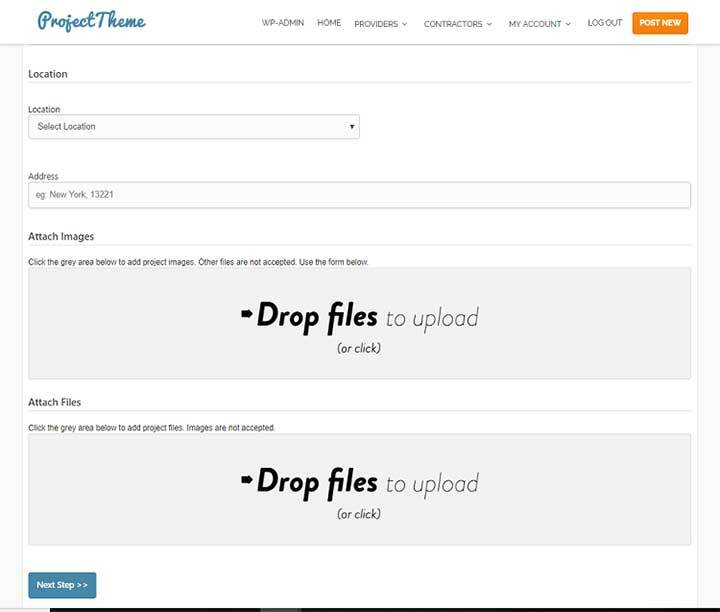 The Project WordPress Theme comes integrated with Facebook, and Twitter so there goes all the login hassles. Apart from this your users can talk about a job or project, like them, share them and gain more insight. Being the owner of the website, this is a great medium for you to gain popularity and generate healthy traffic into your site. How to Use Project Bidding WordPress Theme? The features available at the back-end is endless. So I am going to take you on a brief tour that helps you move around the theme get some of the fundamentals with ease. At the back end, the employer and the freelancer will have their custom dashboard with the basics of their profile, job history, current jobs, listing status, payment history, earnings, etc. The admin dashboard has all the necessary tools for you to manage the website without any knowledge of coding efficiently. I must say, the developers have done a fantastic job to make it so user-friendly. Now when you create a website with this theme, there are two possibilities how a user can use it. As a recruiter to post jobs. As a freelancer to get projects. Let’s see how to use this theme as three different users. As mentioned above, every admin will have their admin panel. Once they log in to the website through their security credentials, they will land on to this admin panel. On the left side of your panel, you will have three different menus. 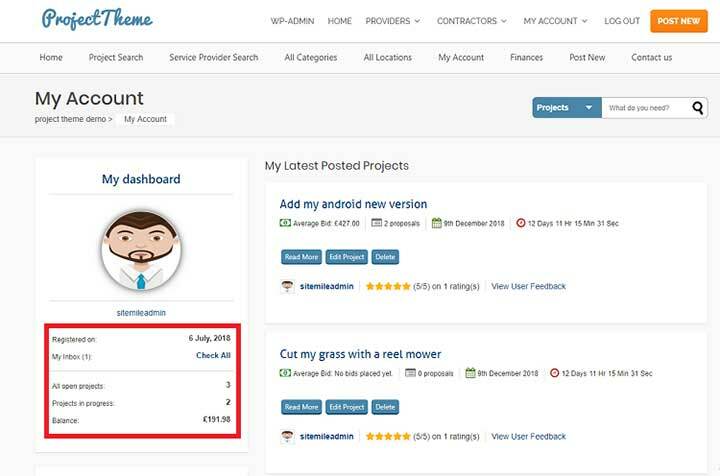 Just below your profile picture on the left side, you can see the numbers of your open projects, projects in progress and the balance you are supposed to pay to the freelancers you have just hired. You can post a job as an employer right from your admin panel. For that, you will see an option called “Post New” on the top right corner of your panel. Click on it. You will now be directed to a new page. You can create your job here. You will have some blank fields here which you are supposed to fill up to best describe your requirement. Here is a screenshot of the page you will be directed to. Here you will have four different tab options. In the first tab, you need to fill the basic info about the job. 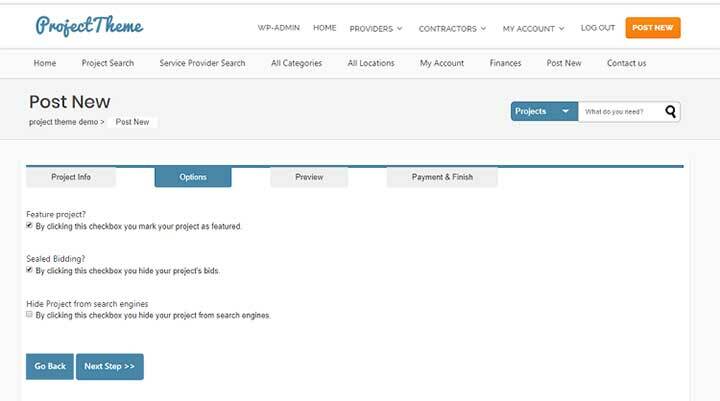 For example Project Title, Description, Category of the job, Tags, Skills, Pricing Budget, Ending date of the project, Location, and Address of the job to be done. You can also have a picture uploaded just to make it appear more professional. It will also give the bidders an idea of their prospective work. You can also add any other files that you think is relevant for the bidders. Fill up all the details and click on the Next button. In this tab, you can choose how you prefer your ad to be displayed. Check the first two boxes and leave the third unchecked. You may keep the 2nd unchecked too if you want your bids to be open to all. Clicking on the “Next” button will show you a Preview of what your job will appear as for your bidders. Click on the next button to complete the payment. Here you will have a confirmation message on your screen, and you need to approve it for the finalization. And that’s it. Your post will go live and be open for bidders. To start bidding, you will have to register yourself first. Click on the “Register” Button on the top right corner of your screen and register yourself as a Service provider. Your password will be emailed to you, using which you are now ready to log in to the site as a Service Provider (Freelancer). Check your Spam folder if you cannot find it in your inbox. You will now be in your admin panel. Now if you are a freelancer and you are looking for, say an Accounting job. All you need to do is go to the Homepage of the website that was built with this theme and look up for it through the search field. Now hit on the Search Projects button, and you will find a list of jobs that match your search. You can make your search even more specific by using the fields on the left side of your panel. When you land on your desired ad, you can click on it to start bidding. Your search result will appear like this. You can now Contact the owner, Send him a proposal, or even message him personally whichever is more convenient for you. Project WordPress theme offers so many customization options that no other similar theme does. 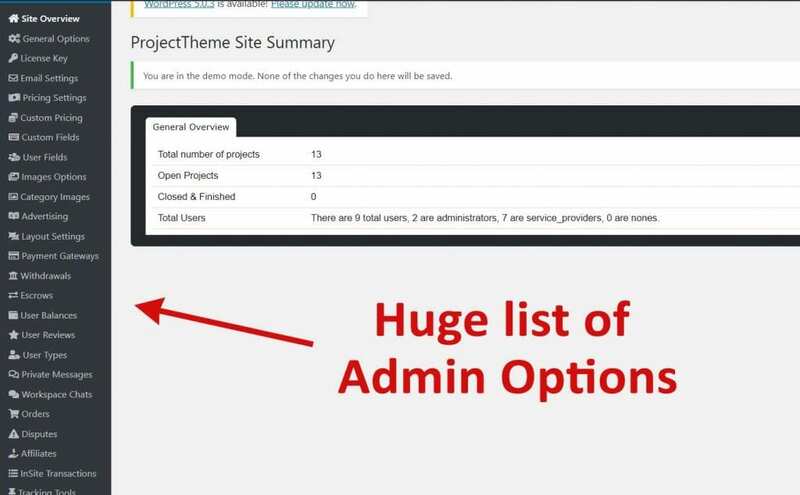 We won’t be going in detail discussing each option from this list, but from the labels of each item, you can conclude that there is almost every setting option that can be used to change or customize the site as an admin. 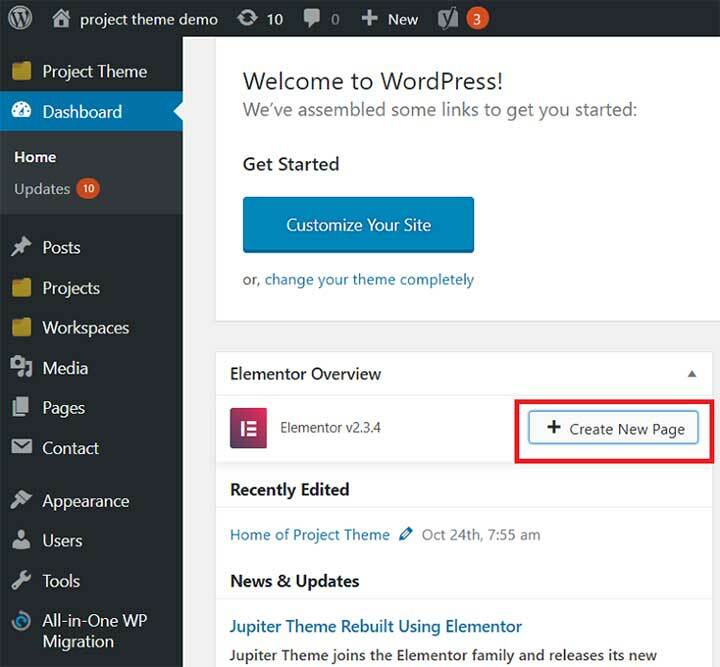 A good option to customize your website is to use the a good page builder such as Elemenator Page Builder, Thrive Builder, or Themify Builder that comes tagged along with the theme. You can use the pre-built templates as an inspiration to give a kick to your creative skills. Let us see how to work with the Elementor. To use this page builder, you will first have to go to the dashboard of your WordPress site. Under Elementor Overview, click on Create New Page. The following page will show up on your screen. You can now explore all the possibilities to come up with the most striking design. Just drag and drop elements from the left and continue working. Suppose you want to add a heading. Drag the heading element and drop it on the page. On your left you will see fields to add texts, links select fonts, choose a size and align it. You can use the styling options above these fields to change background and more. You can also add more elements from here like images, buttons, texts videos etc. and edit them from the options in your left. Here’s an example of what you can create. 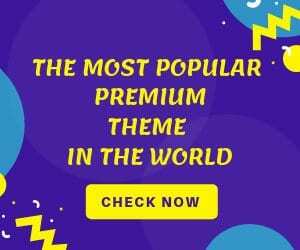 If this theme hasn’t excited you even till now, then this theme offers tons of exciting and powerful theme extensions when you pay a few extra bucks. This is an incredible way to monetize from a project and also make it more exciting. This feature allows you to divide a project into multiple milestones. So when a milestone is completed, part of the payment is given to freelancer. This ensures that you can keep a higher margin on the projects and earn at least double the normal amount. The Project WordPress theme with this plugin map allows you to locate and search places by zip codes or postal codes and also shows a distance radius both in KMs and miles. 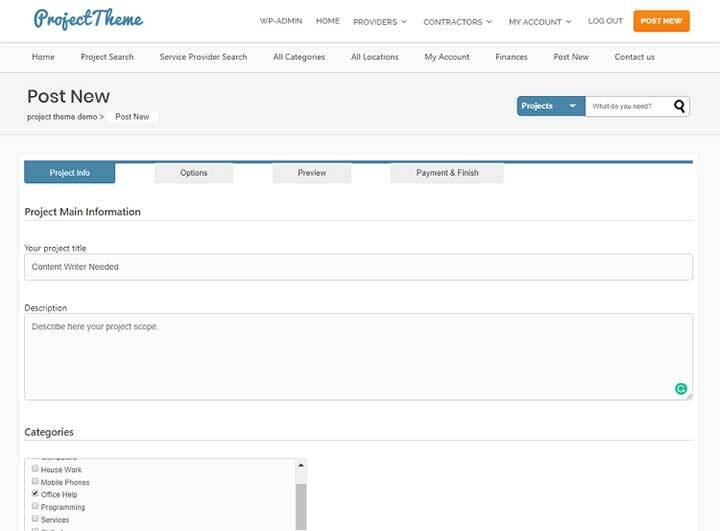 The Project WordPress Theme also offers you the Escrow feature. The concept of this feature is that the owner of the project will deposit virtual money for the freelancer who wins the bid until the completion of projects. Post completion, the funds are released by the bid owner to the freelancer’s account allowing him/her to withdraw the amount via the admin of the site. Affiliate marketing is one of the most growing businesses currently, and it is gaining a lot of favouritism. Well, the Project WordPress Theme does not let you remain behind. With this plugin, you can allow your users to promote your website thus increasing the viewer base while earning a decent commission for every sale conducted on your portal. Yes, the private messaging is there, but for plugin worth 25 dollars you can enable the user base with a live chatting facility. A real-time way for the employers and freelancers to connect over jobs, projects, queries, and everything professional. The Project Theme comes under three different prices with the basic version starting from just $99. You can use it in unlimited number of websites. It also offers support and free updates for 12 months. However, the base version does not offer access to any extension. You get access all the extensions in the Pro and Membership version. Well, the Project Bidding WordPress theme has an awe-inspiring set of features to keep the users hooked and also ensuring steady and progressive monetary growth for the business owner. 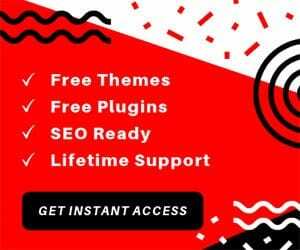 The theme is currently supported by the latest WordPress 5.0.3, and they keep updating the theme on a monthly basis to keep you ahead of the competition. 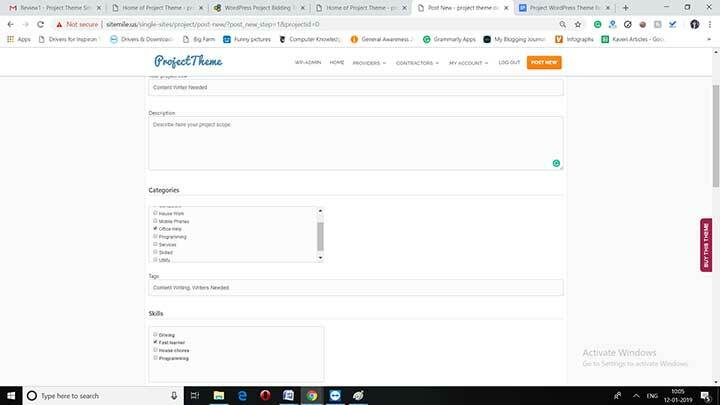 So if you are looking for a theme for starting your online business which matches the capabilities of this theme or if you are business owner planning to move your website on a new theme, then this is where your search ends. Extremely well written content and much more value added words! Great work buddy! I have learned a lot of things from here and yes this WordPress theme has the similar functionality as Upwork has. Extremely a tremendous theme to start building freelance site. Every steps you have shared, just awesome and learned a lot o things after reading this. Keep up the great work!